Is Part Of is exactly "Hemsworth, Ron collection. Subsection B"
Eleven men in three rows, kneeling, sitting and standing in front of a goal. Behind are their huts. 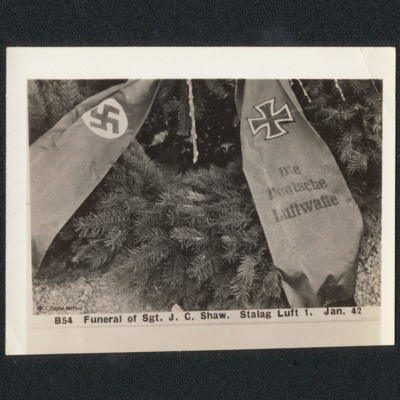 A wreath from the Luftwaffe on the grave of Sergeant J C Shaw. It contains the words 'Die Deutsche Luftwaffe'. 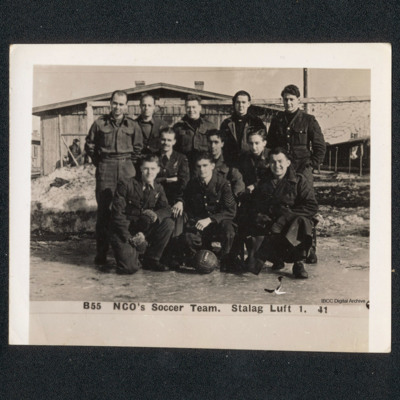 A group of airmen at the internment of Sergeant J C Shaw. Two, on the left are saluting. Other airmen are holding wreaths for the grave. Light snow on the ground and trees bare of leaves in the background. 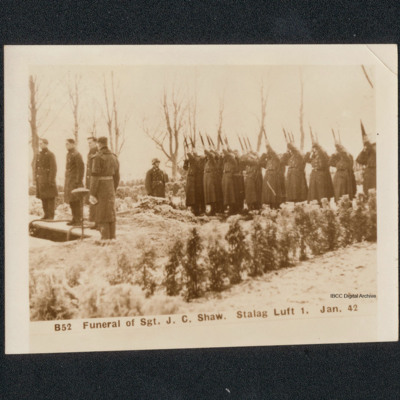 Four airmen stand at the grave of Sergeant J C Shaw. On the right German soldiers fire their rifles in salute. A German officer and two airmen in greatcoats saluting at the internment of Sergeant J C Shaw. Other airmen are holding wreaths to be laid on the grave. In the background the graveyard is lightly covered in snow, with the trees bare of leaves. 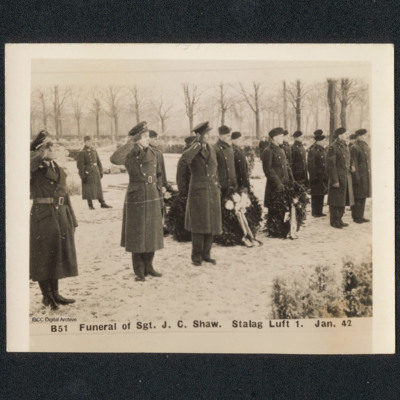 The grave of Sergeant J C Shaw covered in wreaths. In the background are more graves and bare trees. 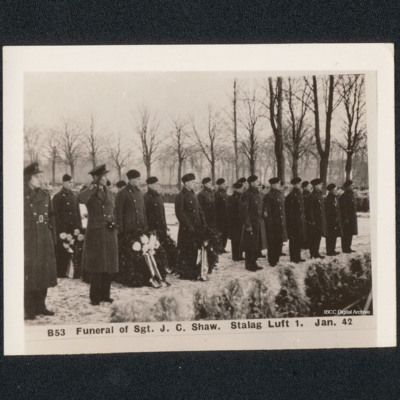 The coffin of Sergeant J C Shaw is laid to rest by his fellow airmen. A group of German soldiers with rifles stands guard. The trees are bare of leaves. 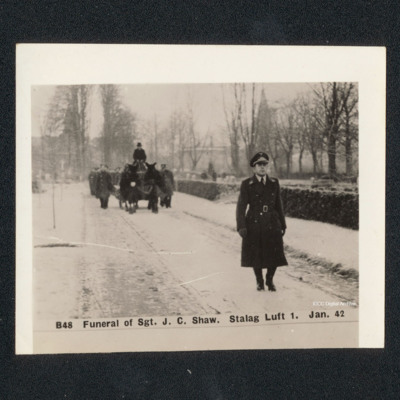 A German officer leads the hearse containing the body of Sergeant J C Shaw. Behind the hearse are rows of British airmen wearing greatcoats. In the background is the graveyard and trees. 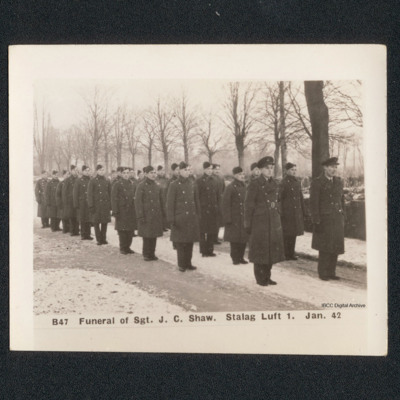 Group of airmen in greatcoats standing to attention at the funeral of Sergeant J C Shaw. They are arranged in three rows. Behind are woods and the graveyard. 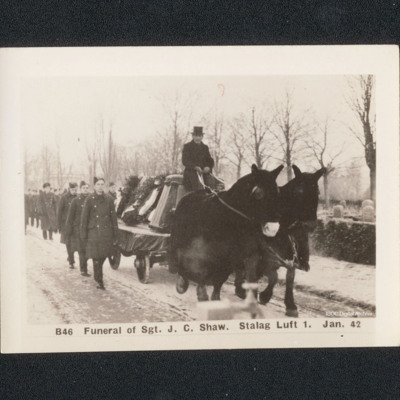 Horse drawn hearse with the coffin of Sergeant J C Shaw. There is a large group of airmen in greatcoats marching behind the hearse. The graveyard can be seen on the right of the photograph. The coffin of Sergeant J C Shaw flanked by wreaths, flowers and two airmen. In the chapel at the camp. One wreath has 'RAF' and the other 'Die Deutsche Luftwaffe'. 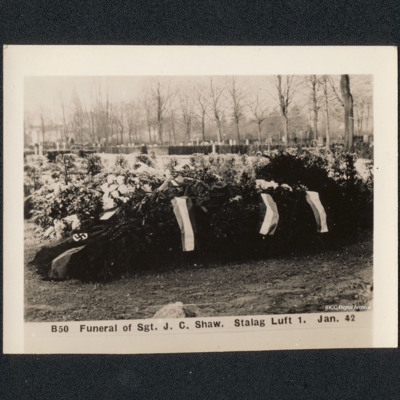 Sergeant J C Shaw lying in state in his coffin, guarded by two airmen. They are in the chapel. 17 actors from Jack and the Beanstalk standing on the stage. 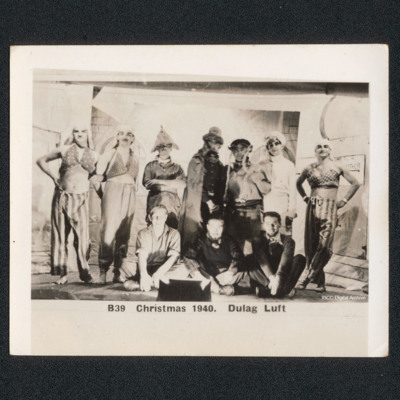 The are in a variety of costumes and some men are dressed as women. Four actors standing on the set of the pantomime. One is playing a King and three are dressed as women. One is wearing imitation Royal Air Force wings. One man and three men dressed as women. One woman is seated on the man's knee. The two other women are standing at the side. The backdrop shows a painted staircase and corridor. Head and shoulders of two actors, both dressed as women. One has imitation Royal Air Force wings. Both are wearing wigs. A group of ten men wearing pantomime costumes. Three are dressed as women. Three men are seated and the remainder are standing. 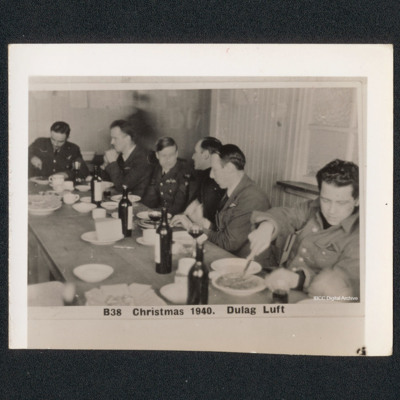 Six officers and a non-commissioned officer seated at table having their Christmas dinner. On the table plates, cups, glasses and bottles of wine. 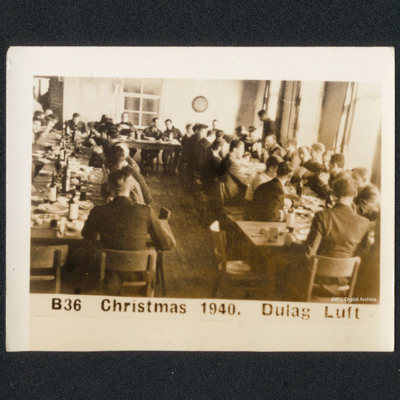 Group of men seated at U shaped table, all turned to face the camera. Two men standing at back. Glasses, mugs and plates on the tables. 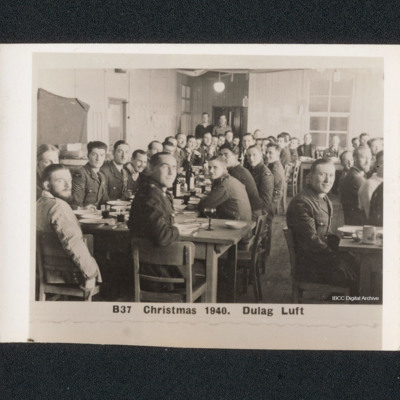 Group of men sitting at tables arranged in a U-shape inside a hut. Crockery and wine bottles are on the tables and a dart board is on the wall. 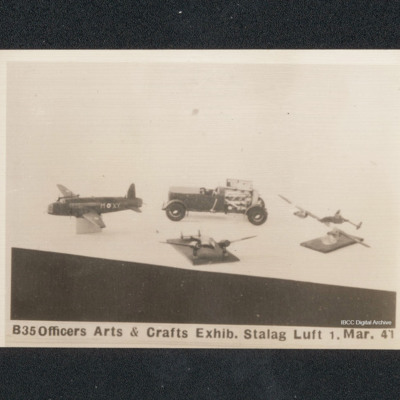 Large model car with three aircraft on stands. One is a Wellington and one is a Hampden. A group of airmen sitting and standing around a long table. The table is set with a cloth and decorations. Christmas decorations are hanging from the ceiling. 14 men inside a hut decorated for Christmas with paper chains across the ceiling. A man dressed as Cinderella is dancing with another man dressed as Groucho Marx. The stage backdrop is decorated with toilet seats. A witch stands in front of her home. The witch is wearing long black robes and a pointed hat. Behind there is a sign saying 'Mon Repos' over the door. At the side another sign says 'Private Abattoir'. On the wall there is a skull and crossbones.